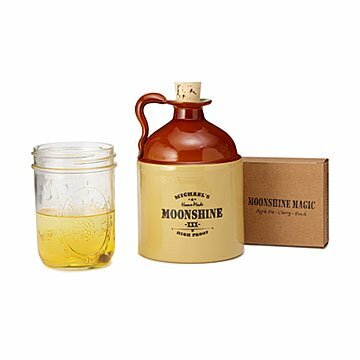 Make "moonshine" at home with this kit that includes a personalized jug and three fun flavors. Drinking a little flavored moonshine = good idea. Keeping a still in your basement = bad (and possibly illegal) idea. Fortunately, this fun, personalized kit lets you whip up a batch of "bootleg" hooch at home. Just pour vodka or a grain alcohol of your choice into the jug (made to look like one a bluegrass singer might fill up with good ole mountain dew) and then add the included apple pie, peach, or cherry flavoring. You don't have to get too fancy with the cocktail mixers (unless you want to) or wait for fermentation, so you'll be throwing back that white lighting in no time. Made in Virginia. 6" H x 4.5" Dia. Love having the personalization to make it a more thoughtful gift. It was great to get something or my brother who is difficult to buy for, but also not just have it seem like I googled "Christmas gifts for men" again and picked the coolest result. Despite my bad experience(s), trying to order what I thought would be a "unique" Christmas gift for my father-in-law, I have to say, the Customer Service provided by Uncommon Goods was excellent. Very prompt and efficient.